Flexibility can be gained, but it requires patience and a long and disciplined process of work. I suppose you are a dancer, so I recommend you to make from half an hour to one hour of stretching exercises every day when you wake up, after your breakfast. This means that you need to organize your life so that you have that time available. Also, you should relax and stretch again before any class or rehearsal, if your body is cold. The time for this depends on the class or rehearsal that follows, as much as on your physiological needs. Therefore you should observe your body and its reactions to movement so that you learn to recognize what you need. Once you’ve finished rehearsal or class and are very warm, you should stretch again. Do this after performances too, even if you are willing to go out and talk to the audience immediately. Summary:…to be more flexible you need to do a lot of stretching… a looooooooooot… . But again, each dancer has specific physiological needs, so always pay attention to the messages coming from your body. Too much pain is not a good sign. Also, remember that dance is not only about acrobatics. I tell you this because that’s what you need the flexibility for. Dance is also about expression, musicality, sensing, thinking, communicating, relating to a context and other issues. If you are not very flexible, you can always dance, maximizing any of the other components of dance as an aesthetical strategy. I am 11 going to turn 12 next month.I would really want to dance and my mom is willing to pay for dance classes as from next year.But will I be able to dance at 12?I am a bit fat n I think I will not cope 😢😢please help me....please tell me what to do and where to start because I have no clue of how to dance! Where to start contemporary dance ? PS:do u know any good dance schools in EastLondon? Your teacher will decide in which group you fit better. I understand that you prefer to be with partners of your same age, but if they are more advanced, it may be better to be with the ‘minis’ for a while, to catch something up before. Please read my first reply in this chat. You'll fond a link to a page with stretching exercises there. It may be useful for you. Im swedish so sorry if I spell wrong sometimes. I’m 11 going to 12 and I love dance! In Sweden you can’t really have dance as a job it’s more like just a fun thing. I can’t do split or anything. I can’t do gymnastics either and I’m really sad because dance is what I want to do. I take classes but asi said is not that serious. Like it’s one day per week. So I don’t learn that much and aslo its hip hop. And I want to dance contemporary. What should I do? When I think about start to train to make a split I just end up cutting myself. Should I just give up dance? 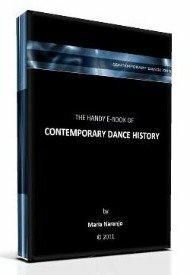 If you want to learn contemporary dance, you should start right now. You will see that contemporary dance is not about doing splits, even though some dancers may do splits now and then. Contemporary dance is a wide choreographic art and people without much flexibility can practice too. This is a long explanation. I recommend you to explore and read this website thoroughly. By reading about the history, watching videos or heariing about the different techniques, you may understand better what I'm trying to tell you so briefly. Just start your classes and complement them with personal research (watch videos, go to performances, try different classes or teachers, read related texts). You may find your way in.